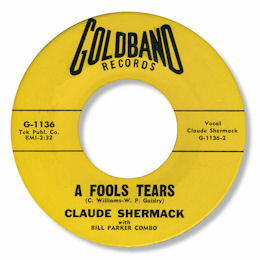 Although Eddie Shuler's label is famous for its Cajun output, lurking in the catalogue are a few southern soul items from the likes of Lee Bernard and Claude Shermack. Undoubteldy his masterpiece is the wonderful deep ballad A Fool's Tears. The recording is very "muddy" and it's hard to make out exactly what's going on behind Shermack. There's an organ for sure and some horns but that's about it - the effect (intentional or not) is to focus attention on Claude's truly excellent voice. He puts a lot of gospel flourishes into the rendition but the best parts are his hoarse shouts and screams. Electrifying is not the word. Love the minor keyed bridge in the middle too. His second 45 isn't quite up to that standard but "In Reality" is a strong ballad well worth seeking out. It is possible that all four sides were cut at the same session as the overall "feel" of the releases is strikingly similar. Kudos to to Louisiana veteran Bill Parker whose combo provided the backing.